And it is on in Saudi Arabia! Fourteen people, including 11 policemen, were hurt when riots erupted in a Shiite-majority village in eastern Saudi Arabia, state news agency SPA said Tuesday, blaming the unrest on a "foreign country." "A group of outlaws and rioters on motorbikes gathered" at a roundabout in the village of Al-Awamia in Al-Qatif province on Monday "carrying petrol bombs," SPA said, citing the Sunni-ruled kingdom's interior ministry. The group carried out acts causing "insecurity with incitement from a foreign country that aims to undermine the nation's security and stability," SPA quoted a ministry spokesman as saying. "Security forces managed to deal with those traitors at the spot and after they were dispersed, machinegun fire erupted from a nearby neighbourhood." And it is now reported that rioters carried "Hezbollah and Iran flags...in addition to Iranian clerics pictures." Not gonna happen! First you need the three major blocs to all agree on a workable power-sharing arrangement. Only then you can expect them to start working on an agreement on one draft, before it can pass a vote by parliament. Right now, there's no end in sight for the grand power-sharing disputes. The deal is finally signed...it's unclear yet though whether it includes the same lame weapons package announced in the original notification. The final price will also be significantly lower than the $3-4 billion estimate. How much exactly? We'll have to wait, but I guess it will be around $1 billion. Congrats to the women of Saudi Arabian who now have the right to vote and run for public office...A huge step forward. You're not gonna believe what this radio station in Somalia did! The "Al-Andalus" radio station offered weapons (and cash) as prizes for winners in a Quran memorization contest this past Ramadan. The first place winner got an AK-47 and the equivalent of $700. Second place winner got an AK-47 too, plus the equivalent of $500 in cash. The third place winner, well, he got 2 hand grenades and $400 in cash...The contestants? Children between 10 and 17 years old. This escalation will most certainly reflect negatively on the border ares of Iraq's Kurdistan Region. Actually, with a joint Ankara-Tehran operation possibly in the works, it looks like the KRG has some really tough days ahead. 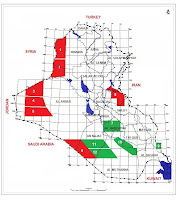 It could also very well influence the KRG position in their negotiations with Maliki, who will probably try to leverage the situation to improve his position..It would be a shame if the KRG allowed this to weaken their position and give up on their new joint effort with Iraqiya to enforce the power sharing agreement. Egypt's Political Parties Affairs Committee has made a brave decision, barring the extremist Al-Gamaa Al-Islamiyya from registering as a political party. The way this enfolds will have deep effects on the future of Egypt's political system. If this ruling stands, Egypt will succeed in avoiding one of the biggest mistakes we made in Iraq when all filters were removed. We ended up allowing those who believed in violence--not democracy or human rights--to undermine the political process from within...I hope Egypt's desire to establish a real democracy does not wane. Production in August hit 2.81 million barrels per day. Going neck and neck with Kuwait, who has also been frantically ramping up output this year. With significant revenue growth in the pipeline, the government in Baghdad is already working on a plan to expand next year's budget by more than a third. You will see September numbers dip slightly when the next output report is released. That's because of the temporary loss of exports from Kurdistan Region, which may have been caused only by a technical problem. Prime Minister Nouri Al-Maliki has effectively torpedoed what was left of the power-sharing agreement that led to the formation of his cabinet. In a very short and ominous statement to the press, he stated that Ayad Allawi "is no longer an acceptable partner in the political process." This is going to have serious ramifications, including the potential for the collapse of the current coalition government. Much of what's going to happen next will be shaped by yesterday's negotiations between Allawi and Barzani, and tomorrow's talks between Salih and Maliki. The Ministry of Oil will be trying to squeeze even more revenue out of future development contracts by closing one of the "loopholes" found in earlier contracts. "If the total production is 1 million barrels per day and the cost recovery is (the value of) 300,000 bpd, then we will deduct the 300,000 from the net production and the remainder is 700,000 bpd, so we will pay remuneration for the 700,000 only, not for the 1 million," Ameedi said. "The remuneration will be higher so it is in our interest and I think it is in the interest of the contractor." The calculation change is aimed at cutting the cost of subcontracts, which was inflated by some oil companies under the current deals signed with Iraq, Ameedi said. "We will deduct the cost of subcontracts from the total production and the remaining production will pay remuneration for it," he told reporters on the sidelines of the roadshow. "If that share of production is less, remuneration of the contract will be affected negatively, and if it is high, they will get more remuneration," he said. "It coincides with the idea of production sharing in this sense only. That there would be 'cost oil' but there would not be 'profit oil'." Another Iranian pipe dream, literally. The KRG are saying exports were halted because of "technical difficulties." This could in theory be true, but it's highly unlikely. First, exports were halted immediately after Maliki-Erbil tension boiled over draft oil law disagreements. Second, it happened while the Kurdish parties threatened to even boycott federal parliament and cabinet meetings. Against this backdrop, the technical difficulties story doesn't sound as convincing. "I'm not saying 3-5,000 is the right number," but "there comes a time...when it (US presence) becomes counter-productive...I'm not quite sure what the right number is, but there's a number there somewhere that is -- you've got be careful about." ...he was trying to explain that he wanted the extended US presence, should there be any, to maintain a low profile so as to avoid providing pretexts for AQI, Sadr, other Iran-backed militias to conduct violent attacks. I have to disagree with this reasoning. I think this is not the right metric to consider when deciding the final number of troops--the reaction will be the same regardless of whether the number was 100, or 10,000. 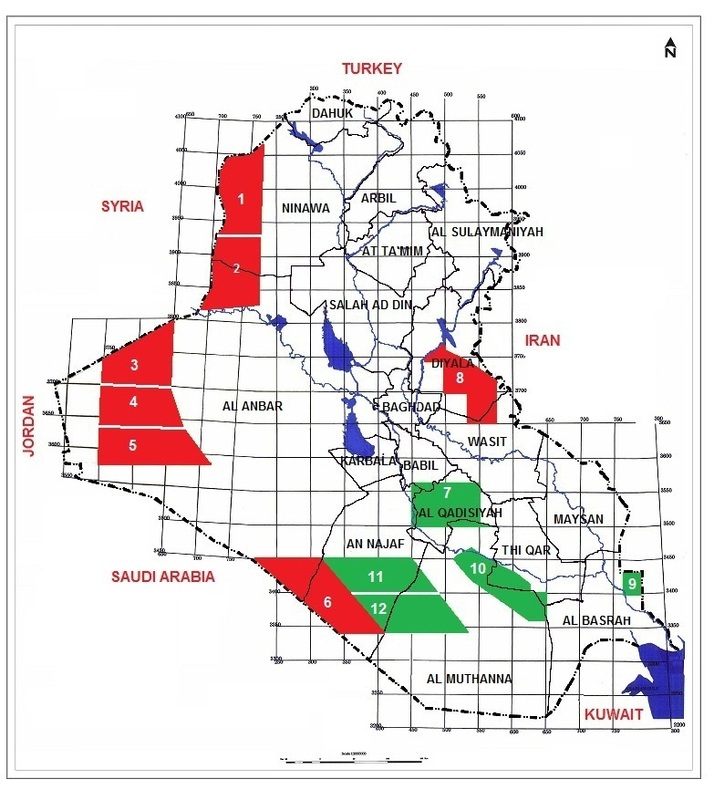 "Out of keenness on Iraq's independence and the withdrawal of American forces from the country, I must halt military operations for the Iraqi resistance until the withdrawal is complete...in case the withdrawal is not complete and Iraq's land remained nonindependent, the decision will be to resume military operations with a new approach and severe might." Effectively, this changes nothing. If any US troops/trainers remained in Iraq beyond the end of 2011, their presence will be used to justify militia operations. Even if no troops remained, the presence of an embassy will be used to justify militia operations...and so on...The decision is already made. Something must have been lost in translation, because this couldn't be coming from Ahmadinejad. Never heard of recent active exploration in this area,which roughly corresponds with the southern edge of "block 2", one of the 12 exploration blocks that will be auctioned off in the upcoming 4th bid round in January. I'd take this one with a grain of salt, for now.